I am the highway to adventure in Alberta's heartland. My route westward begins at the border city of Lloydminster, then follows the North Saskatchewan River across the grassy plains of Wild Rose Country by Vegreville and Elk Island National Park, to Edmonton. From Alberta's Capital, with the most beautiful river valley in Canada, I make a beeline straight west to a place that many agree is their "Rocky Mountain high of a lifetime" ... Jasper National Park. Entering Alberta from the east, when you see an onion-shaped dome or giant Easter egg on the horizon, you know you're heading for Little Ukraine. People from the steppes of Eastern Europe found the Canadian Prairies resembled their original homeland in many ways, and combined their knowledge of agriculture with the sweat of the brows and muscle of their backs to create solid, successful communities such as those you are about to visit. How green is my valley? The County of Vermilion River, which includes the hamlets of McLaughlin, Rivercourse, Blackfoot, Islay, and Clandonald offers a laid back atmosphere. Vermilion Provincial Park and Lea Park provide opportunities for pleasure boating, fishing, and the usual water sports. What's more, visitors can golf with a backdrop of rolling hills, or choose a hiking or horseback riding trail along the verdant Vermilion River valley. Country museums, local festivals and top events like the CRA Lea Park Rodeo and Three Cities Fair keep enthusiastic supporters from near and far coming back in droves. Main Street, Alberta. For Yellowhead travellers coming from the east, the town of Vermilion is likely their first taste of Alberta - and around here; good taste is always in fashion. A walk-around tour of Vermilion's downtown area includes over 30 historic blocks, all lovingly restored, and each featuring an interesting shop or service. The result could easily pass for a Norman Rockwell original, vintage 1930. Add some antique autos, and you've got the perfect movie set. This tree-lined community offers visitors a the pleasures of heated outdoor swimming pool, a nine hole golf course and in winter -- a km-long snowmobile track. Small wonder that, several of Canada's Olympic athletes come from this area. Fun events are always in season -- including a spring and fall rodeo, a spring music festival, a summer agricultural festival and an autumn trade fair. Places to visit are "FireWorks"- Canadian Fire Museum and Discovery Centre, the Alberta Fire Training School and Lakeland College. A year-round destination in the Lakeland Tourist Zone, the County of Minburn attracts major sports events and is a magnet for vacation and recreation bound travellers. Activities include everything from hunting and fishing to water sports, camping and other pleasures of the great outdoors. Multicultural activities abound, hosted by churches, light theatre groups, service clubs, agricultural societies, arts and craft guilds. Check the official Yellowhead map for a minute. See how the County of Minburn occupies a vast, park - like area, which straddles the Trans Canada Yellowhead Highway, from a point an hour west of the Saskatchewan border to its outer limits an hour east of Edmonton. There are 37 townships in the county, the main centres of activity being Innisfree, Lavoy, Mannville, Minburn, Ranfurly, Vegreville, and Warwick. Get Quacking. The world's largest mallard duck stands tall at Andrew, a hamlet near Whitford Lake Wetland Preserve. His presence is a magnet to nature lovers. Being the heart of a well-travelled waterfowl flyway, hunters and bird watchers flock here to catch the action each spring and fall. Due to its rich cultural mosaic, Lamont County is called the "Church Capital of Canada," many of them crowned with a familiar onion dome signifying their Ukrainian origin. Lamont County offers self-guided driving tours to 47 different churches and shrines in the area. Another popular heritage site is the Old Walker School house in Bruderheim. Other Lamont County communities are Chipman, Lamont, Hilliard, Mundare, St. Michael, Star/Edna and Wostok. At the Andrew Museum, a railway caboose and mini golf keep the kiddies amused, while the bigger kids and grandpa take a journey into history. 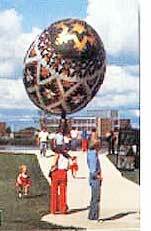 Vegreville is home of the Ukrainian Pysanka Festival, with its fly-in breakfast and 3 solid days of food and fun. Vegreville is a vibrant community in the heart of central Alberta; rich in cultural heritage, modern facilities, and natural resources. It's showpiece of recreation is an indoor Aquatic and Fitness Centre complex with water slide, leisure pool, whirlpool, sauna, fitness room, racquetball court and dance studio. Attached is an indoor ice arena. Located on the Canadian National Railway line, Vegreville is also serviced by a modern airport with a new terminal building and 4,000 ft runway. Should you wish to stay, it's an excellent place to live, thanks to low taxes, reasonable housing and rental prices, first class educational, medical, recreational and cultural facilities along with a wide range of retail services. While agriculture is the primary industry, the Town also has regional offices for Trans Canada Pipelines Ltd., ATCO Electric, Telus, Alberta Agriculture, Prairie Farm Rehabilitation Administration and Farm Credit Corporation. Manufacturing of gas field equipment and farm machinery provide employment to over 200 people. Vegreville is also the home of the Immigration Canada CASE Processing Centre and the Alberta Research Council. An unusual collection of East European art, church relics, and Ukrainian artifacts is in As museum at the Basilian Fathers Monastery. Included are a 12th century gospel handwritten in Old Slavic, four 14th-century icons, copies of the first printed Latin Bible (1520) and the first printed French Bible (1558)Also displayed are a 17th-century altar cloth embroidered in silver and an Italian violin (1723). Stained-glass windows in the monastery's St. Peter and St. Paul's Church depict the life of Christ and the history of Mundare and the Ukrainian people. In a chapel-like nook in the vestibule is an enlarged reproduction of an icon (of the Mother of God) at Pochayev in the western Ukraine. (The original icon was investigated by a church commission in 1770- and accredited with 5349 miracles). The church, an octagonal brick building with a wooden dome, is crowned by eight semi-arches and an aluminum cross. Where buffalo roam. If you ask, one of the park guides can relate the fascinating story of how Elk Island National Park got its name, and became a popular attraction. In this wooded sanctuary which straddles both sides of the Trans Canada Yellowhead Highway, over 400 buffalo roam. They share the park's rolling hills, wetlands and grassy meadows with moose, mule deer and elk. Did you know that Canada has two distinctive breeds of buffalo - the woods and plains variety? Both are represented here - but kept at a safe distance and protected by an iron fence. Poplar, spruce, aspen and birch line a network of hiking trails, connecting with lakes and sloughs that teem with waterfowl. Elk Island National Park's Sandy Beach recreation area has a 9-hole golf course. A thatched-roof dacha houses the Ukrainian Folk Museum, saluting the major ethnic group that settled this area. Strathcona County's Beaver Hills area includes Cooking Lake, Lake Edmonton and a bevy of smaller lakes. Its wildlife population includes fox, lynx, bobcats, wolves, beaver, muskrat, moose, bear, martin, mink, elk, mule deer, white tail deer, and a few caribou. Principal communities are Fort Saskatchewan and Sherwood Park. A popular meeting place and residential area, on Edmonton's doorstep, Sherwood Park was the site of the Trans Canada Yellowhead Highway Association's 56th Annual Convention. The delegates found it ideal, being next to one of Canada's most complete multiplex sports facilities under one roof. The very latest member of Strathcona County's eleven golf courses is the Northern Bear Golf Club, a new Jack Niklaus Signature Course. Wayne Gretsky of NHL and Olympic Hockey fame, headlined its first tournament in 2002. Cooking Lake. Modern day amenities include Strathcona County Kinsmen Leisure Centre, Millennium Place Aquatic Centre with an indoor wave pool, lazy river, water play structure, and a 10 lane competition pool. Bird watchers enjoy the County's numerous nature spots, such as Ministik Bird Sanctuary, Collingwood Cove, Hastings Lake, Kawtikh Retreat, North Cooking Lake, North Bruderheim, Astotin, Baseline Pond, Bretona Pond and others. If you love to shop 'til you drop, or hanker for some succulent, world famous Alberta Prime Rib, you'll love it here. After all, there's no provincial tax. With the North Saskatchewan River flowing by, the Yellowhead Highway at its doorstep, a glorious Indian Summer that stretches the outdoor season, lakes galore and savory Ukrainian food, few places can match it as a healthy vacation spot and gateway to adventure. Circle Tour development is flourishing to Jasper National Park and the Columbia Ice-fields. Listen to this testimonial: "No place I know has such energy, or capacity to seize the moment. Edmontonians have always been a cocky lot, from their sports dynasties and oil czars, to politics. Even the location is cocky. Perched regally on the North Saskatchewan cliffs, its Upper Level bridge reaching from Alberta's Legislature to the Garneau district and University of Alberta campus." And who else has the audacity to build a shopping Mecca that rates seven mentions in the Guinness Book of World Records? West Edmonton Mall has it all, from its huge indoor swimming pool and ice rink to high fashion shops that rival those of Paris and New York. Speaking of highs and lows, Edmonton's river valley, from Old Fort Edmonton to the Conservatory and beyond, is a tourist destination all by itself; golf courses and picnic spots. Get out and stretch your legs; this is the largest greenbelt of any major Canadian city. Edmonton as a boomtown? ... its archives tell of fur traders, riverboats, a Klondike boom, a railway boom, a land rush, and black gold that blew things sky high in '47. " Plane Facts? Legendary bush pilots, who opened up the North live again at Canada's Aviation Hall of Fame. Wop May, Max Ward and Grant McConachie are three that spring to mind. Edmonton played a prominent role during World War II as a USAF Northern Command Centre. With high frequency year-round service to London-Heathrow and others, Edmonton International Airport is very well-positioned. Beyond the outskirts of Edmonton is Lake Wabamun (try saying that with your mouth full), a popular camping spot. The Town of Edson serves the more than 17,000 people in its trading area. It not only has much to offer to the tourist seeking a natural vacation, but also to any business person seeking opportunities to expand into the area. As the Slo-Pitch Capital of Canada, Edson annually hosts the Kinsmen Slo-Pitch Tournament - 256 slo-pitch teams from Western Canada battling for top spot on the diamond. The Galloway Station Museum is a former railway station operated by the Edson and District Historical Society. It houses artifacts of the Grande Trunk Pacific Canadian Northern and Canadian National Railways. Also exhibited are artifacts of the coal mining and lumber industries which are the foundation for the establishment of the town. The Red Brick Arts Centre is the restored and renovated former Edson School Building (1913) and a registered Historic Resource. It is home to arts and cultural events throughout the year. The Centre houses an Art Gallery, the Hatlen Theatre, School Room Museum, Dance Studio, Meeting Rooms, Gift Shop and Kitchen. Talk about thriving on competition; the first Rocky Mountain House was raised in 1799. Weeks later, James Bird, helped HBC erect a rival fort. Explorer David Thompson trekked to the Columbia River from here in 1807, and for generations Rocky was the Northwest's richest fur-producing area. The series of forts that stood on these hallowed grounds are remembered by two stone chimneys. Other exhibits include a York boat, Red River cart and fur press. Many travelers first experienced this Rocky Mountain playground by train, sprinting off for souvenirs during a station stop. Most however arrive on four wheels. By car you can seize the moment, cooling off under a waterfall, standing bug-eyed at a viewpoint, or catching every photo op. Allow at least an extra day for this Rocky Mountain high. Why? --Jasper Park Lodge, the Whistlers , Punchbowl Falls, Pyramid Lake, Henry House, Jasper Lake, Skyline Trail and Pocahontas for starters. 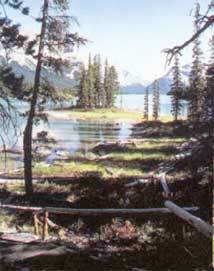 Top choices are Miette Hot Springs -- hottest water in the Canadian Rockies, and Maligne Lake, a portrait of serenity. A friend of Yellowhead describes it as follows, "Our first lodging was a war surplus tent; the most recent was years later at luxurious Jasper Park Lodge, where the waiter brought dinner to our cabin by bicycle. We've enjoyed it both ways." Near the mouth of Rocky River, a cairn marks Jasper House National Historic Site, where a supply post was built by the Northwest Company in 1813. The park is a wildlife sanctuary, where deer and antelope play, bighorn guard the peaks, and bears are everywhere. The Ice fields Parkway ranks among the world's great highroads, with glaciers standing like 100 icy sentinels. Jasper National Park's southern boundary is The Columbia Ice fields, a marvel of nature with the largest mass of ice in the Rockies. A fleet of Snow coaches traverse the Athabaska glacier, looking from a distance like ants on a giant vanilla marshmallow sundae. This seventh wonder is part of a formation that blanketed Canada for a million years. The highway follows the Sunwapta River, joining its cousin the Athabaska at Sunwapta Falls. The hottest water on the entire drive (54°C) is at Miette Hot Springs, near Jasper Lake, and Punchbowl Falls. Don't worry, it's cooled to a comfortable 39° in the swimming pool. Allow at least an extra day in the Jasper area , and enjoy a Rocky Mountain high you'll never forget.